There are a handful of truly life changing days in a person’s life. Certainly, the day in August, 1978 when I gave my life to Christ was one of those days. December 18, 1993 was another – the day I married my wife and best friend, Becky. July 31, 1998 was a third life changing day. It was on that day that I became a father. David Gregory Corbin was born. I love this picture of David that was taken on a recent family trip because it captures his personality. That sly grin gives a window into the sense of humor that all who know David enjoy. On that day fifteen years ago, it was impossible to imagine David being a 6’3″ athlete who would playfully put his arm on my shoulder and say, “You’re short!” It was also impossible to imagine the many joys and occasional tears that being a father involves. Nothing quite changes your life like becoming a father. Being David’s father has certainly changed me – for the better! David is extremely smart and talented. 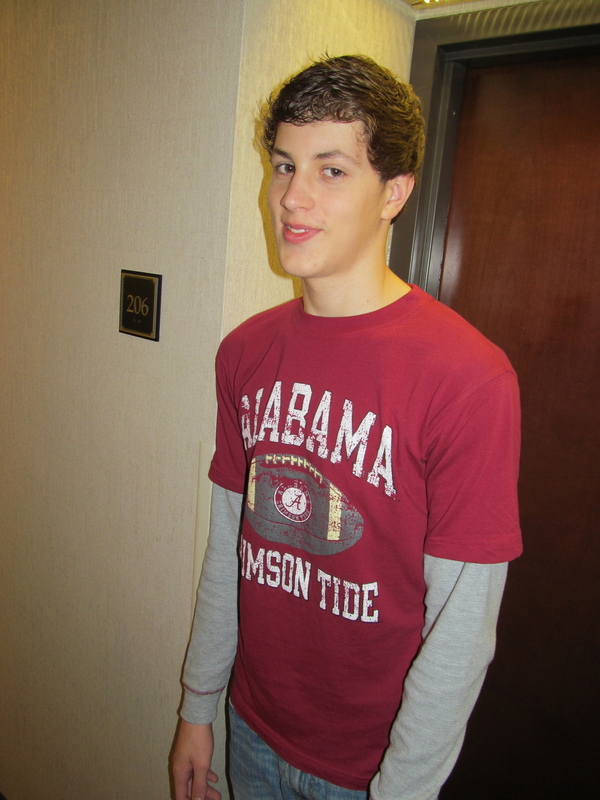 He is a very good athlete who averaged 14 points and 8 rebounds per game on the varsity basketball team as a freshman. He enjoys drawing and is a little “artsy.” He is extremely funny – especially when he gets warmed up! He is well liked by his peers and teachers at school. He is respected at school and at church and our student ministers tell me that other kids look to him as a leader. He is great with younger kids and one of his favorite ways to serve is as a leader in our AWANA ministry, helping with the younger groups. Most of all, I am thankful that I see David growing as a Christian. I had the privilege of leading David to the Lord in his bedroom after church one Sunday night and baptizing him while we served in Pell City. THOSE were some special moments! As he enters these crucial older teenage years, I continually pray that his faith will continue to blossom and truly be his own in a more real way than ever before. David, your dad loves you and is proud of you. Happy 15th birthday to my “eldest son” and to a wonderful young man! I have no idea where it came from, but somehow the idea has become embedded in American Christianity that missionaries, evangelists, and pastors are those who are sent. Certainly, part of those particular callings involves being sent by the Lord to the places He leads us to serve. However, I believe that scripture teaches that every Christian is sent out by the Lord. He has a plan and a purpose for every one of His children. God’s plan for every Christian is that we walk in the good works that He has prepared for us to do. Think about that. In a very real sense, every Christian is sent. We are sent out into the world to do the good works that He has prepared for us and thereby bring glory to Him. That’s why I say every Christian should “live sent”, meaning that we should view our everyday lives as opportunities to do good work for our Savior. This Monday, why don’t you pray and ask the Lord to show you where and how you can bring glory to Him in even the most trivial tasks of life? Live sent. How do you witness to someone of another faith or no faith? As nearly every community in America grows more diverse, it becomes increasingly important to get comfortable sharing Christ with people of another faith or no faith at all. For those of us who grew up in the Bible belt, that can be a daunting task. Some time back, I shared a message with our high schoolers on this subject. Here are the highlights of it. May we all share Christ with someone this week! Years ago, I became concerned about a friend of mine because I knew his family didn’t go to church and I was afraid that he was not a Christian. One day I talked to him about it. Do you know what he said? “I don’t believe all that stuff.” “How do you know the Bible is really true?” “How do you know that your religion is the right one?” “I just take some of your religion and some of another religion and make my own religion.” AND I HAD NO IDEA WHAT TO SAY! That conversation with my friend was my first experience with a world that believes everything. I have had many since. Have you noticed that more and more people say things just like my friend said? How would you respond if you had someone say to you, “I don’t believe the Bible. I believe the Book of Mormon.”How can we tell the world if the world doesn’t believe? The world does believe. It just believes all kind of stuff – mostly the wrong stuff. Some of Athens’s most prominent features were its numerous pagan temples. The great temple to Athena (the Parthenon), the Erechtheion (dedicated to multiple deities), and the temple to the goddess Roma and the emperor Augustus stood atop the acropolis overlooking the city. Many other pagan sacred sites have also been found, confirming Petronius’s satirical assertion that it was easier to find a god than a man in Athens. B) The number of people in America who tell surveyors that they have no religion at all has DOUBLED in the last 20 years. I could tell you about whole countries in our world where very few if any people have ever heard the gospel. However, did you know that there is a growing number of people right here in Alabama who have never heard the gospel? Just the other day, I talked with a man who lived within a couple of miles of our church, but who had never heard about Jesus and the cross. If you don’t remember anything else I have shared, don’t forget this: DON’T ASSUME ANYONE HAS HEARD THE GOSPEL. Make sure by sharing it with them. You don’t get anywhere by just condemning people. I once knew of a young man who attempted to witness to a non-believer that he had met while in college. The conversation started out this way: “How does it feel to be going to hell?” Now the person who did that – they had their theology correct. If the person did not believe in the Lord Jesus Christ, they were on their way to hell. However, he approached it all wrong. You can go about the right thing the wrong way. The Apostle Paul does a good job in these verses of connecting where the people were. Start out with where they are in their understanding. Why is it important to go back to creation? Because anybody with any sense knows that this world did not get here by accident. There are truly not many people who believe that this planet and the people on it just happened by chance. Not many at all. Most people believe that there is a creator because they inherently know that all of those could not have just happened by accident. How does this help us tell the world? I once witnessed to a young man who told me that he was agnostic, but I took him back to creation and he believed that there had to be a creator. “Wouldn’t it make sense for that creator to reveal Himself?” That led me to Jesus and the Bible. Do you know why some people just cannot open their mind up to anything but the idea of evolution and the fact that there is no God? Because to believe there is a God in Heaven who made the world would mean that there must be some rules in this universe. Don’t shy away from sharing with someone of another faith or no faith. God will use you to build bridges into their life and, if you approach them respectfully, you will gain a hearing for the gospel of Christ! The reason Barnabas was able to be such an encourager is because he was that kind of man. The truth is that everyone who is in leadership leads from who they are, not their position on an organizational chart. People don’t follow positions; they follow people. Barnabas was the type of leader that people followed because he was an Acts 11:24 man. Occasionally, someone will ask me how they can pray for me. Pray that I will always be an Acts 11:24 man. This past week our family spent the week along with 24 other members of our church on a mission trip in the Williamsburg, Kentucky area. As usual on a mission trip, I found myself immeasurably blessed by the folks that we went there to help. Each evening, our team helped Wolf Creek Baptist Church conduct Vacation Bible School. This church’s story is truly “a God thing” that blessed me and I wanted to share it with my readers. Wolf Creek Baptist Church is a 202 year old church (not a typo) in an extremely poor, rural community about seven miles outside of Williamsburg. This part of the country sees the effects of generations of poverty, the breakdown of the family, abuse, drugs, and a host of other ills. 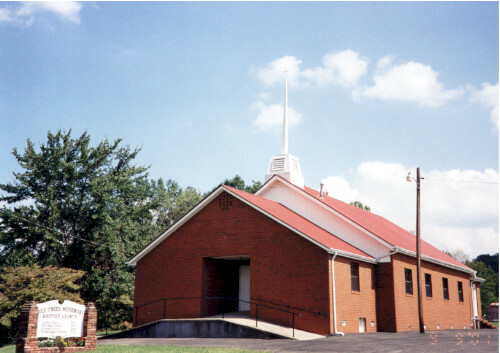 A number of years ago, Wolf Creek Baptist Church had only a handful of faithful attenders and was making little impact in its community. Then Pastor John Justice had a vision. The Lord began to stir his heart to lead the church to minister to the children of the area. According to Pastor Justice, he saw children growing up in generational cycles of spiritual lostness, poverty, neglect, and pain. According to members of Wolf Creek, Pastor Justice told the church, “If we don’t do something about it with the kids, nothing will ever change.” That simple vision from the Lord was the beginning of great things. With few people, little to no money, and an old church van, Wolf Creek stepped out on faith and began its journey to make a difference. Today, Wolf Creek has between 75-100 children and teenagers in attendance EACH SERVICE – Sunday morning, Sunday evening, and Wednesday evening. Very few of those kids are brought by their parents. Wolf Creek members use four vans to go get them and then take them home. These kids, many of whom are growing up in situations that are heartbreaking, are loved unconditionally, taught the Word of God, and told of the difference the Lord Jesus can make in their lives. Oh yes, because many of the kids do not get adequate food at home, the church FEEDS THEM EACH SERVICE. That’s right. Wolf Creek feeds 75-100 children and teenagers every Sunday morning, Sunday evening, and Wednesday evening. The members of Wolf Creek say that they have to do that because meeting their physical needs must happen in order to meet their spiritual needs. Wolf Creek consistently sees as many as forty of these kids come to faith in Christ each year. In fact, a couple of years ago, they were #10 in the entire Kentucky Baptist Convention in baptisms. All of this ministry is carried out by a core of group of less than 30 adults who attend the church regularly. The bulk of the work is done by six or seven families – week in and week out. This is one reason why Whitesburg goes up there for Vacation Bible School each year. It gives these faithful families a welcome break from having to carry the whole load. In addition to this small group of faithful members, Wolf Creek’s budget is small as well: $600 per week ($31,200 per year). The church rarely has a month when it meets its budget, but somehow its few bills get paid and the ministry is funded for another month. “When the money runs out and we don’t know what we are going to do, God provides,” is how one church leader described it to me. The truth is that I went to be a blessing to Wolf Creek, but I was far more blessed to get to know them. In fact, I was downright convicted and challenged by spending time with that little church. Wolf Creek has an old building that is totally inadequate for them in every way. They have few leaders and little money. They minister to children and families who live in circumstances that in many cases are almost unbelievable. Nothing they do is easy. Every single thing requires work. Yet, I found the people of Wolf Creek Baptist Church to be extremely positive. All week long I kept hearing phrases such as, “God is at work” and “It’s His ministry not ours.” They were certainly grateful for the help, but they were eager to share what God was doing among them! They steadfastly believe that one day God will provide a new building for them, and they aren’t discouraged at all that after two years the building fund only has $16,000. God provides. They are generous – even though they have very little. They insisted on presenting our mission team with a gift. One more amazing thing: Wolf Creek Baptist actually does mission trips. You read that right. This little church recently sent a mission team to help a church in another part of the country. As we headed back to Alabama on Friday, I left there amazed and humbled. In all of my years of ministry, I have never seen a church that did more with less that I saw at Wolf Creek. They do it week in and week out with no pay, no recognition, and no sign that their work will get any easier. They do it by faith that God will provide, sometimes not knowing how the ministry will be funded for another month. Few people have ever heard of Wolf Creek Baptist, and far fewer have ever seen first hand what they do. However, I believe that Heaven knows exactly what is going on at Wolf Creek, and I believe that the Lord is smiling on it. Why do I say that? Because the Lord knows that Wolf Creek Baptist Church is rich in the things that really matter.